Alfred Hamerlinck (Assenede, 27 September 1905 – Ghent, 10 July 1993) was a Belgian professional road bicycle racer, who won many small races in his career – he achieved 82 wins. 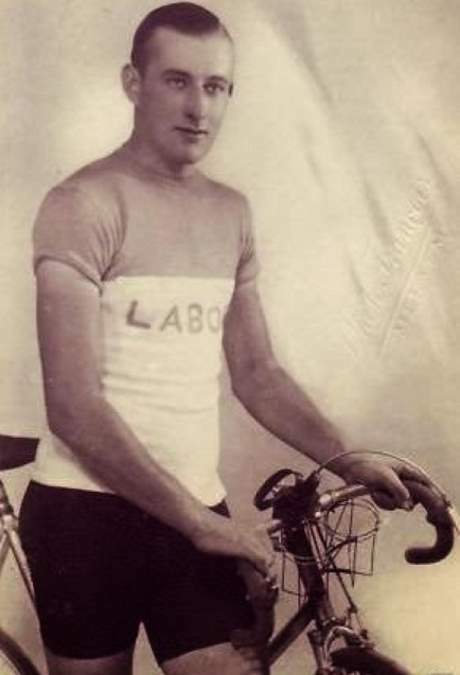 He also won two stages in the 1931 Tour de France, and wore the yellow jersey for one day. Andy Hampsten: “Ernie”. 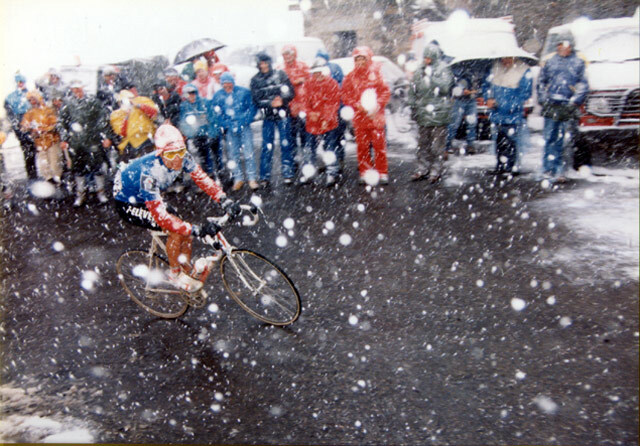 In the photo, Andy Hampsten is climbing up to Passo di Gavia at the Giro d’Italia 1988. Andrew Hampsten (born April 7, 1962 in Columbus, Ohio) is an American former professional road bicycle racer who won the 1988 Giro d’Italia and the Alpe d’Huez stage of the 1992 Tour de France. Over the first two climbs, the cold, wet riders stayed together. When they began ascending the Gavia with its patches of fifteen percent gradient (back then, only the Gavia’s switchback turns were paved), it began to snow and as the riders continued up the pass, it got ever colder. Johan Van der Velde, in just shorts and short sleeves, was first over the top. He was followed a few seconds later by Breukink, Hampsten and then by Chioccioli and Marco Giovannetti. Breukink and Hampsten had dropped the Italians well before the summit and crested together. The conditions were appalling; the road was frozen and when the riders began the descent, their brakes wouldn’t work on the frozen rims. Some had their gears jammed up with ice. Van der Velde gave up, dismounted his bike, waited for warmer clothes to be brought from the team car and descended the steepest part of the pass on foot. He lost 47 minutes that day. Hampsten and Breukink pressed on down the steep, icy descent and into Bormio where Breukink won the sprint. Andy Hampsten became the first American, and non-European, to win the Giro d’Italia. Roger Hassenforder (born 23 July 1930, in Sausheim) is a former French professional racing cyclist from Alsace. He was a professional cyclist from 1952 to 1965. He was known as the joker of the pack, earning him the nickname “boute-en-train”. He was known for his interviews during the course. His major victories as cyclist were in the Tour de France, but he did not win much in other races. His best years were 1955-1959, when he won eight stages in the Tour and wore the yellow jersey for four days. After his cycling career ended, he opened a restaurant in Kaysersberg, that was a favorite meeting place for cycling fans in the 1960s, and is still run by the Hassenforder family (now his family owns also a hotel there). Albert Hendrickx (born 19 July 1916 in Kalmthout and died on 13 May 1990 in Hasselt) was a Belgian cyclist. 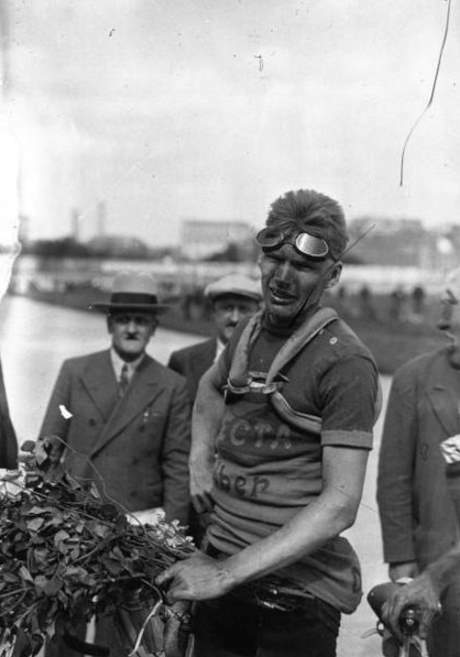 A professional from 1934 to 1951, he won Paris-Brest-Paris in 1948 and was on the podium of Paris-Roubaix (1937) and Liège-Bastogne-Liège (1946) – both of these races he finished in second. Luis Alberto “Lucho” Herrera Herrera (born May 4, 1961 in Fusagasugá, Colombia) was a professional from 1985 to 1992 but had a successful amateur career before that in Colombia. He entered his first Vuelta a Colombia in 1981 where he finished 16th overall and 3rd in the New Rider competition. Although he abandoned his second Vuelta a Colombia in 1982, he won Colombia’s second major stage-race the Clásico RCN. In 1983 Herrera won Clásico RCN again as well as two stages and finishing second overall to Alfonso Florez Ortiz in the 1983 Vuelta a Colombia. In 1984 he would win the Vuelta a Colombia, the Clásico RCN as well as winning stage 17 to Alpe d’Huez in the 1984 Tour de France, becoming the first Colombian to win a stage of the race, and the first amateur cyclist to win a stage in the history of the Tour de France. He would win the Vuelta a Colombia and the Clásico RCN four times each but his greatest achievement was in 1987, when he won the Vuelta a España, the first South American to win a Grand Tour. Herrera also won the Critérium du Dauphiné Libéré in 1988 and 1991 and five “King of the Mountains” jerseys from the three Grand Tours. Luis Herrera is the second rider to win the King of the Mountains jersey in all three Grand Tours. The first was Federico Bahamontes of Spain. 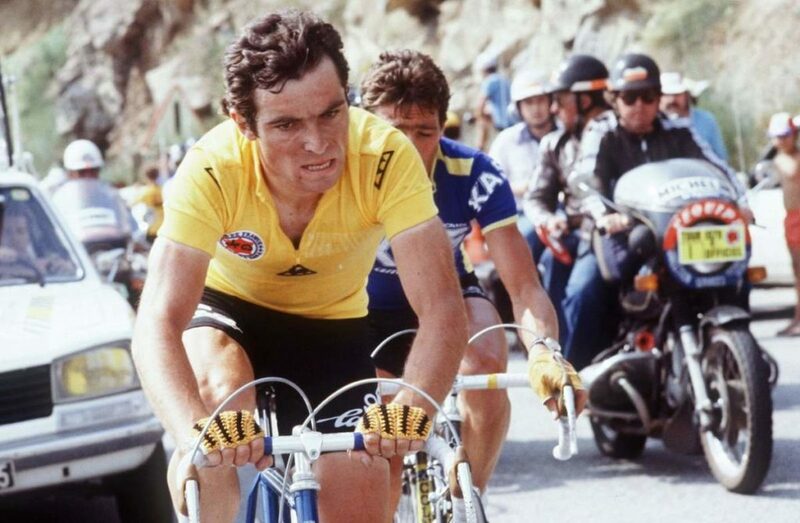 Bernard Hinault: “Le Patron”, “Le Blaireau” (The Badger), “The shaving brush”. Bernard Hinault (born 14 November 1954) won the Tour de France five times and remains the last French winner of the Tour. He is also one of only six cyclists to have won all three Grand Tours, and one of two cyclists to have won each more than once (the other being Alberto Contador). 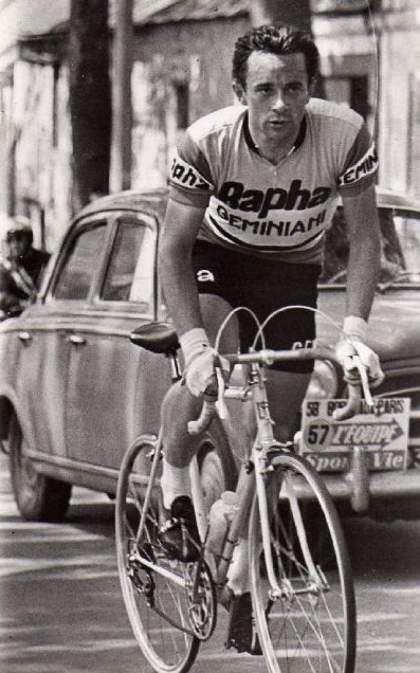 He won the Tour de France in 1978, 1979, 1981, 1982 and 1985. He came second in 1984 and 1986 and won 28 stages, of which 13 were individual time trials. 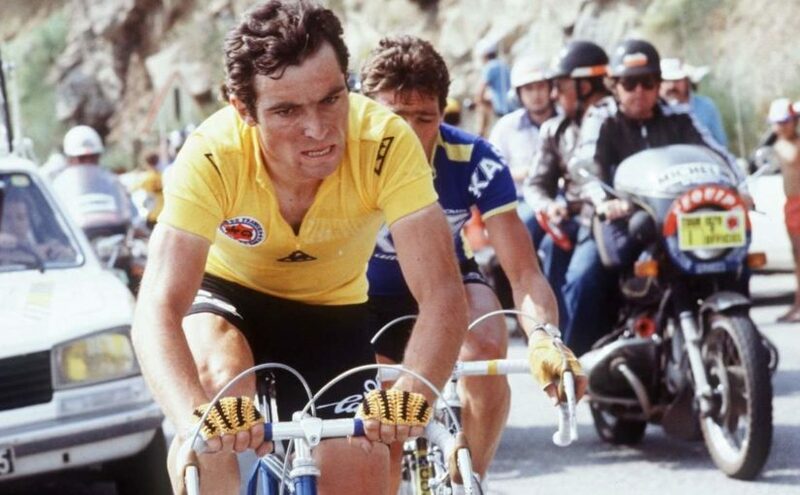 The other three to have achieved five Tour de France victories are Jacques Anquetil, Eddy Merckx and Miguel Indurain; of these, Hinault is the only one to have finished either first or second in each Tour de France he finished. Hinault was nicknamed Le Blaireau (either “the shaving brush” or “the badger”), as he would often don a hairband, thus resembling a shaving brush. However, his nickname is typically translated as “badger” by Anglophone cycling commentators and enthusiasts. In an interview in the French magazine Vélo, however, Hinault said the badger nickname had nothing to do with the animal. He said it was a local cyclists’ way of saying “mate” or “buddy” in his youth – “How’s it going, badger?” – and that it came to refer to him personally. According to Maurice Le Guilloux, a long-time team-mate of Hinault, he and Georges Talbourdet first used the nickname when the three riders trained together in their native Brittany in the early years of Hinault’s professional career. 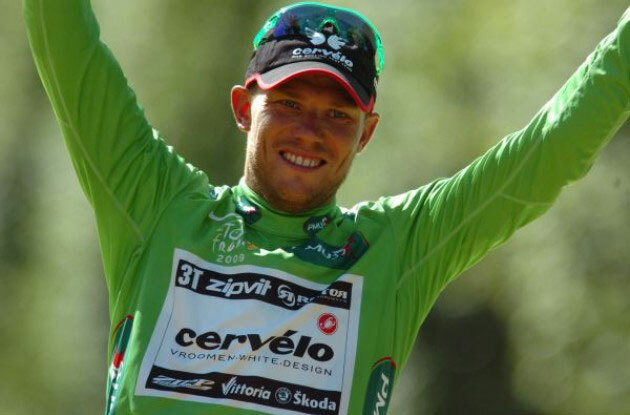 Thor Hushovd (born 18 January 1978) is widely considered the greatest Norwegian cyclist of all time. He was a classics specialist and a sprinter, as well as a time trialist. Hushovd is a three-time Norwegian national road race champion (2004, 2010, 2013), and was the winner of the 2010 World Road Race Championships. He was the first Norwegian to lead the Tour de France, and first Scandinavian to win the road race in cycling world road championship. He is also the Scandinavian with the most stage wins in Grand Tours. He retired in September 2014. Thor Hushovd was nicknamed “The Norwegian Bull”, “The Bull from Grimstad” and for obvious reasons, “The God of Thunder” (in Norse mythology, Thor is a hammer-wielding god associated with thunder, lightning, storms, oak trees, strength, the protection of mankind, and also hallowing and fertility).